Nicole J Ullrich, MD, PhD is currently Associate Professor of Neurology at Boston Children’s Hospital, where she serves as Director of Neurologic NeuroOncology at Dana-Farber/Boston Children’s Cancer and Blood Disorders Center and as Associate Director and Director of Clinical Trials in the Multidisciplinary Neurofibromatosis Program at Boston Children’s Hospital. She completed her medical and graduate degrees at Yale University followed by residency in Pediatrics and Neurology at Boston Children’s Hospital, where she then did her fellowship in NeuroOncology before joining the faculty. Her research focuses on neurologic and oncologic complications of NF1 and the long-term neurologic complications of childhood systemic cancer and brain tumors. 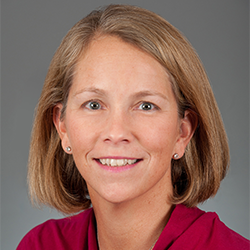 Dr. Ullrich is Chair of the CNS Late Effects committee, Neuroscience Discipline and Cancer Control/Neurotoxicity committees through the Children’s Oncology Group and is co-chair of the Neurology Task Force of the Long-term Follow up Guidelines for COG.